"There is a place where can you visit two oceans, explore the rainforest, climb mountains, tour vibrant urban areas and cities, meet people from a long list of different backgrounds and cultures, and choose from fourteen national parks. It is a place where you encounter the largest number of flora and fauna throughout the Americas. It is a country where you can find ruined fortresses, evidence of the famous pirates of old, and where an almost endless list of outdoor activities awaits. Where is this impressive place? - It is Panama." At the day of your arrival in Panama one of our Panamanian representatives will pick you up at the International Airport Tocumen and transfer you to your hotel. 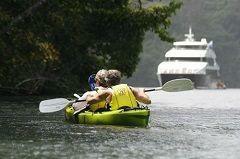 "Gatun Lake - The Panama Canal is much more than a marvel built to transit vessels from one ocean to another. With it, a vast zone of tropical forest has been devoted to protect its main resource: fresh water. We take you to explore this wonder in expedition kayaks to allow you a close encounter with the sorroundings of the Canal - Nature, our treasure that makes it possible. Every time a ship crosses the canal towards the Pacific Ocean at Miraflores Locks or towards the Atlantic Ocean at the Gatun Locks 52,000,000 gallons of fresh water are spilled from Gatun Lake. It used to be the world biggest artificial lake. 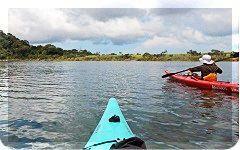 With the creation of Gatun Lake many mountain tops were turned into islands. It offers endless channel possibilities to scout wildlife. In its shores covered by dense tropical forest you will find all kinds of tropical flora and fauna." "Bocas del Toro - the "Caribbean West" area of Panama, is a place that looks exactly like a picture postcard of paradise. Pristine white sand beaches, brilliant blue sea waters, and small islands that seem as if they were made by the hand of a talented designer rather than nature all add up to instant relaxation. The name of the area translates to "mouth of the bull", but such an unappealing name does not do the area any justice. Formed by the mainland, a lagoon, nine small islands and a bay, Bocas Del Toro includes the city of Bocas Town (on Isla Colon), Almirante, and Changuinola. The archipelago contains 68 different islands, and all of them are open for exploring, bird watching, swimming, or just enjoying as you sit on the sand and soak in the sun." We will catch a 9 am domestic flight to Colon Island, gateway to the Caribbean Archipelago and Province of Bocas Del Toro, at the northwest of Panama. And today, after checking in our lodge by the sea we will head toward Playa Estrella, behind Boca del Drago to relax and snorkel. After breakfast we get in a motorboat to tour mangroves areas and then go across Dolphin Bay (where it is almost guaranteed we will encounter dolphins) on our way to Cayo Zapatillas. Here we will have lunch, relax and snorkel at its coral reefs. We should be back to our lodge around 4:00pm. At night we will walk through town and visit some night life spots. "Boquete - a small and charming mountain village tucked away on the eastern slopes of “Baru Volcano”. In the mountainous area of Boquete, you will find the coffee heartland of Panama, this region is also wildly popular because of its remarkably pleasant weather. It is one of the most protected locations, meaning that a majority of the area is natural and pristine. It is known for its farmers, who produce citrus, flowers, vegetables and fruits. It is also popular with those who love the outdoors and there are many ways to explore and interact with this setting while visiting the region. Additionally, this region served as the only refuge of the Ngobe Bugle Indians, and they still live in the Chiriquí highlands as well." After breakfast, we will depart in a 30 minutes boat ride to mainland where our shuttle will take us across the continental divide in a 2 hour drive through a beautiful mountain scenery to arrive by 11 am to our lodge in Boquete. After lunch we are up for a completely thrilling zip line. Imagine gliding through the tops of trees that are over a century old, high above pristine rivers, traversing a cloud forest of century-old trees and waterfalls where at any time you may encounter fog and the gentle rain called "bajareque", as well as monkeys. Around 5:30pm you will check back into your hotel, clean up, and then you have time to investigate the little city for your new favorite restaurant. In the morning we will do a three hours cloud forest hike learning about this unique environment. You’ll venture out on one of the many scenic trails surrounding “Barú Volcano”, home to diverse flora and fauna, waterfalls, and lush vegetation. Keep an eye out for howler monkeys, sloths, deer, peccaries, and any of the hundreds of species of birds that live here. Then after lunch we will check out a local organic farm where coffee is planted and processed. You’ll learn about the process of coffee, from farm to cup, taking in the sights and tastes of a place that artfully balances traditional methods with modern advances. "The most popular, and best known river to enjoy white water rafting in Panama is the Chiriqui Viejo, by the Costa Rican border, with a lot of wave trains and Class III+ sections, check White Water Rafting Panama - Rapid Classification HERE." Today we will raft on the Chiriqui Viejo River. With most rapids being Class III, the river is eminently suitable for beginners but with challenging rapids. Depending on the water level and section used we will be rafting about 3-4 hours. This morning we bid a fond farewell to this country we have come to know and are transferred to the International Airport for our flight home or on to other adventures.